I can even put text if you want it, although depending on how long it is, it will likely make the image much wider. Since I'll be cropping the ponies to be as small as possible, the size of each finished image will probably vary slightly. 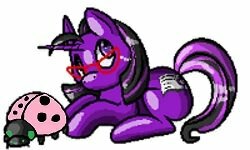 For example, my finished pony (the small version) is 38 by 40 pixels. Feel free to request a canon character from any generation or your own OC, although I'm only doing female characters for now. You can also use my bases by yourself if you want (on the TP only), but please make sure to credit me. Can I have one? Could you make a G4 Style Glory for me? Sure! What size would you like? Could I please get a large version of G3 Toola-Roola 2? Here they are! Glory is already finished as well, but I just need to find out what size she's supposed to be. Thank you she is so cute. The same size as the other ones would be fine. Thank you! These are so cute, you do great work! Could you do fizzy, same size as the others? And could we put these in our own mlptp sigs if we wanted? Hey Truly, do you still want a pixel Fizzy? And you can definitely use them in your signature!